Over the past two days 247 poker players –106 on Day 1a and 141 on Day 1b–took to the poker tables at the Aviation Club in Paris France. The prize they are all seeking is a World Poker Tour title, the first such tournament held at the Aviation Club since 2006. 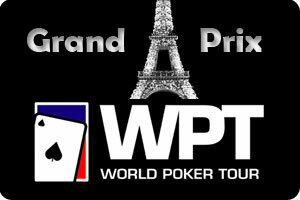 The Grand Prix de Paris was one of the original stops on the WPT, and the only foreign stop for quite some time. In its second incarnation the Paris tournament is the first stop on this the WPT’s 9th season. With a strong international poker pro presence, the final table is shaping up to be a star-studded affair, with players like Isabelle Mercier, Antione Saout, and Andrew Feldman all in terrific shape to make a deep run in the event. With a €2.7 million prize-pool, and €633k going to the winner, the players will be battling hard to reach the final table. Many of the big names who weren’t lucky enough to survive the first day will likely be hanging around Paris for a few extra days; when the €20,000 high-roller tournament is set to begin –The high-roller events are popping up at more and more major tournaments, almost as a second-chance event for the top pros. This entry was posted on Monday, May 10th, 2010 at 7:22 pm and is filed under Poker News. You can follow any responses to this entry through the RSS 2.0 feed. You can leave a response, or trackback from your own site.